Today we had a house full to near capacity with laughing kids and parents. Well, really a backyard full. A community in our space. I love connecting to a community – at church, at work, in the neighborhood, through the kids friends. It was my favorite kind of day. For years, I loved hosting parties. I’ve hosted dinner parties since I got my own place my senior year in college and me and my roommate threw a Christmas open house. They grew more elaborate as I cooked more and had a little more money. I would prepare for days. I stopped hostessing, as I’ve written about before, when the triplets came. Life flipped upside down and the house was a maze of gates and foam floor tiles. When I started entertaining again a couple of years ago, it started outdoors with my front yard table. But as I brought the parties indoors, I returned to my old elaborate ways. Days of planning and cooking and decorating. Themed birthday parties and elaborate Easter menus. As a result, my husband doesn’t love it when I throw parties. Yes, I clean up my piles around the house to his delight, but I can get pretty worked up. That is just an outlet for my planner-Type A-prove your worth self. Today was community. Our end of season baseball party hosted in (or by) the pool on a hot Houston May day. I am not kidding when I say I did nothing. We tidied the house, made easier by a Friday housekeeper. I blew up some emoji beach balls. My hubby bought all the fixins for the burgers and hot dogs which HE grilled out. Everyone else brought everything else. Not kidding. I was utterly relaxed. No frantic last minute running. No rushing back and forth around the kitchen for the timed appetizers to appear at the right interludes. I had a bag of back up tortilla chips and a jar of salsa in case of emergency. It wasn’t needed. Folks brought fruit and drinks and chips and dips and desserts. We used paper plates and paper towels. We had a big bin for trash so it took all of 10 minutes to clean up after nearly 40 people ate. The coaches handed out baseball trophies to wet kids sitting poolside noshing on cookies. The reason this is community, over the other hurried nonsense, is conversation. You can’t make a place for community without space for conversation. That requires you to be present. I’m all too often not present with triplet needs and other demands. We aren’t making space for community. But our kids need to see how important it is to welcome people in. Our kids need to see us laughing and trading stories with other adults. We need to model healthy community for them and with them. Ah community. What better time to grow our community than this summer? I pulled into the driveway just as Bray and two of the three kids were walking out the back door. I’d made great time coming home from a business trip and it was still daylight outside. We’re going on a walk, wanna come? I couldn’t resist. The temperatures had warmed and I hadn’t seen my family in two days. I quickly changed, gathered the third stray, and off we went. We had only made it a block or two when we encountered a family of four. Mom was walking behind a boy about the kids size and dad was pushing baby in a carriage. Would you like to be my new friends, the precious boy on the scooter inquired. We all agreed it would be a lovely idea, and soon found out he was only a year younger than the kids and they lived on the street behind us. Waving goodbye, we each carried on our respective ways. The kids wandered and climbed bricks and ran ahead as we split up to manage the varying paces. We turned toward home and spotted the family a few doors down from us in the driveway. The kids went barreling up as both boys are young and my kids adore little children. I stood chatting with the mom, Bray chatted with the dad, and the kids tried entertaining the one and three year old in their little push cars. We finally tore them away and started across the neighbor’s lawn toward our own. Waving, our across the street neighbor crossed over with his dog to chat. We inquired about his Clemson flag, as the eldest and the baby excitedly described their split loyalties in the Clemson v. Alabama game. Bray continued the conversation as our neighbor friends on the other side of us pulled up. The daughter, a year older than little bit, asked the kids to come over and jump in their bouncy house. The father nodded his agreement as the kids tore off to run up their driveway for time with their favorite brother-sister next door friends. I yelled over at my shoulder, The kids are playing next door, as I ran inside to roast the vegetables. Fifteen months ago, we did not know one family on our street. Today, I felt like I’d stepped back in time to an era when neighbors sat on their front lawns and swapped stories and kids. 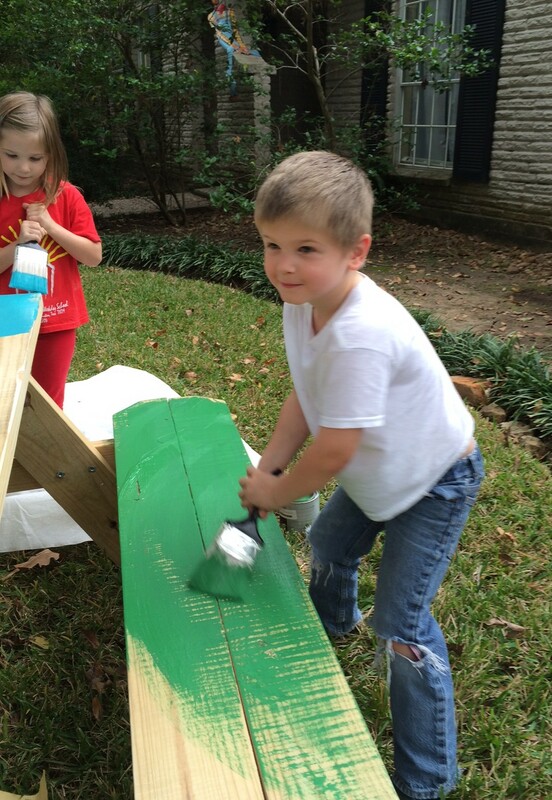 We painted a picnic table and started getting to know folks on our street. Now it feels like home in a way I never even realized we were missing. We’re all so busy. And drivers race through our neighborhood streets far too fast. And the weather and the safety and the discomfort, etc., etc. But if you will push yourself outside your property lines, it will pay dividends beyond what you could have imagined. First one without rain in a month. I had big plans to take the kids to the Children’s Festival since Bray was back in town but between a break-neck paced work week, an overnight Friday board meeting, bad news about my father’s health, and getting sick, I texted Bray before lunch that I wasn’t sure I could do one more thing. He told me to “come on home,” which were the sweetest words I’d heard all week. So aside from begging the kids to take a little nap and watching them play soccer in our driveway, we didn’t do much else. 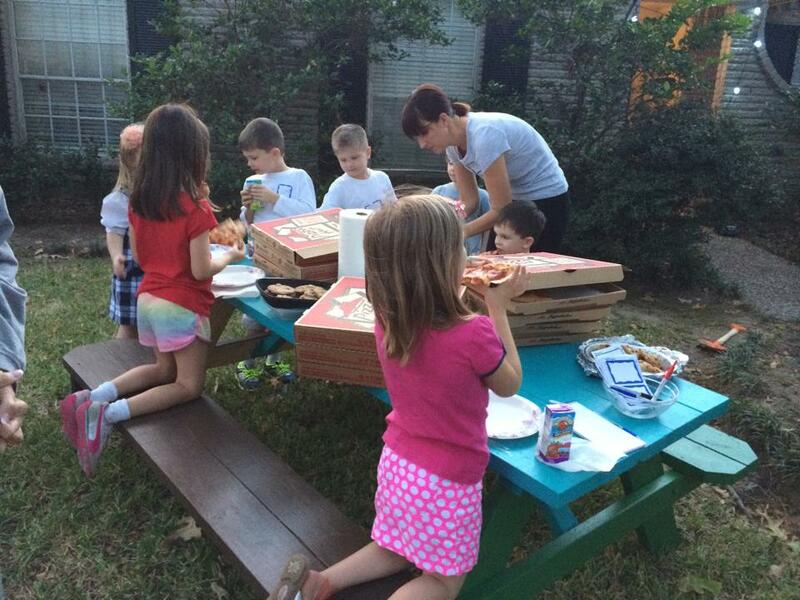 Talk turned to dinner and the kids wanted pizza. We’ve been watching our budget and we neither had any pizza or planned to spend the money to order one. The kids, standing in the back of Bray’s pick up in the driveway, began to chant, “Pizza, pizza, pizza!” with increase crescendo. “What fun for you guys,” I replied and they agreed and scampered off. Bray and I looked at each other and laughed as the kids began to cheer and chant louder from his truck. “Absolutely, thanks so much,” I replied. He continued, “Next time I’m going to have them chant for lobster!” She laughed as she handed the box over the fence. It had been a hard week, friends. And I know we serve a God of big miracles. But sometimes we forget we serve a God who loves doing small things for us too. We say nothing is too BIG for Him to do, but we should also remember, nothing is too small for Him either. He loves each of us and our family so much that sometimes He sends a pizza over the fence. This is the really remarkable part to me. 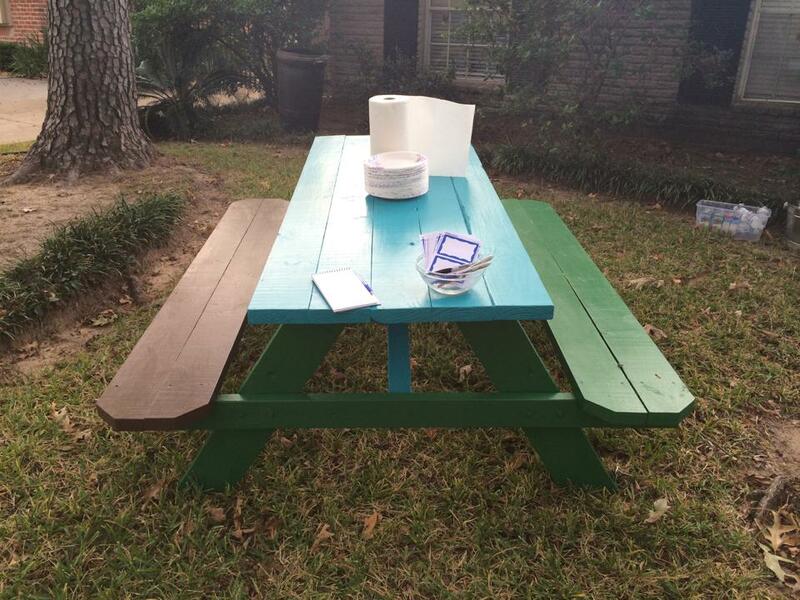 One year ago, I stood in my front yard with a box of pizzas and a wacky painted table having invited our neighbors to come and meet and eat together one evening. We had never met that sweet family on the other side of the fence from us. They have a daughter one year older than our children and a son one year younger (to the day). Our kids now crawl between the hole in our “fence” to play in each other’s yard. They’ve become one of the sweetest treasures of our neighborhood. Had I not obeyed God and stood in that front yard with legs quaking and passed out invitations to our neighbors, we would have never met. They went home with a box of leftover pizza that night one year ago. God returned it one year later on a day we needed a reminder He’s got the whole world in His hands. He can stand in the midst of the greatest wars and most horrific losses and still meet our little individual heart needs. With something as simple as a pizza over a fence. I have a crazy picnic table in my front yard now. 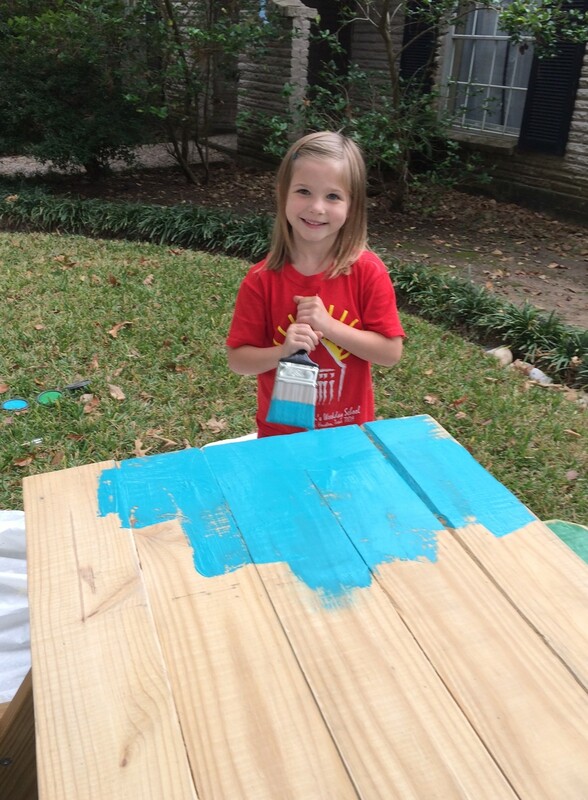 Yes, that’s a turquoise, kelly green, and cocoa brown picnic table. There’s this long and winding God story of how I got from hearing a message at Allume about hospitality and having six families I’ve never met in my front yard this week. Twelve kids (only one of whom was older than 6). But I’m still trying to figure out how to share it because I’m pretty overwhelmed at what God did to my little scaredy-cat, make-a-good-show, heart. I will write a little about the journey once I’ve sat with it a while and it’s still pretty much unfolding. I will say I did a lot that made me uncomfortable. 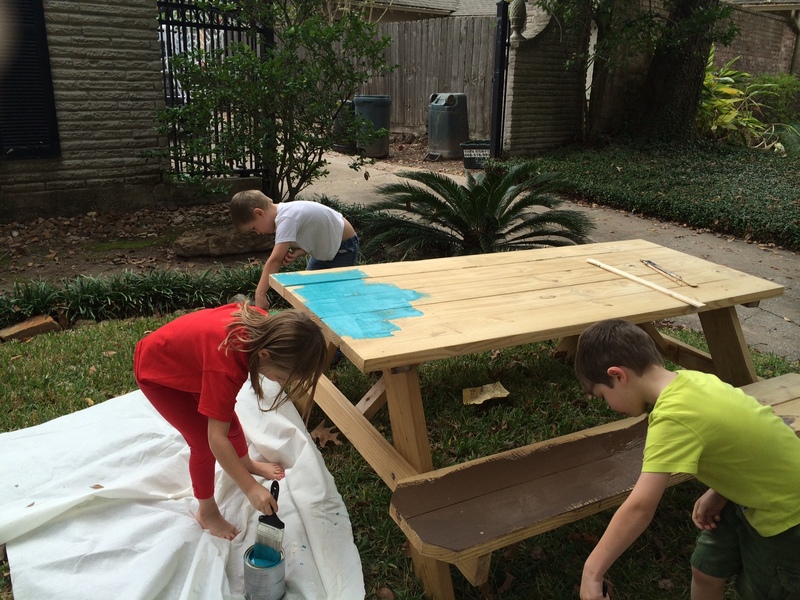 More than just driving the hubby’s truck to pick up an unfinished picnic table at Lowe’s and then spending the weekend sanding and painting a table with permanent paint with three five year olds (yes, they were each allowed to pick a color they wanted to use for the table). More the uncomfortable “what will people think” actions. Walking up and down my street on Saturday morning with my kids and putting flyers in everyone’s mailbox inviting them to come to “the table” for Monthly Mondays. The first of which would be the very next Monday with pizza and drinks. Standing in my front yard with my kids at 5 pm wondering if anyone would come. 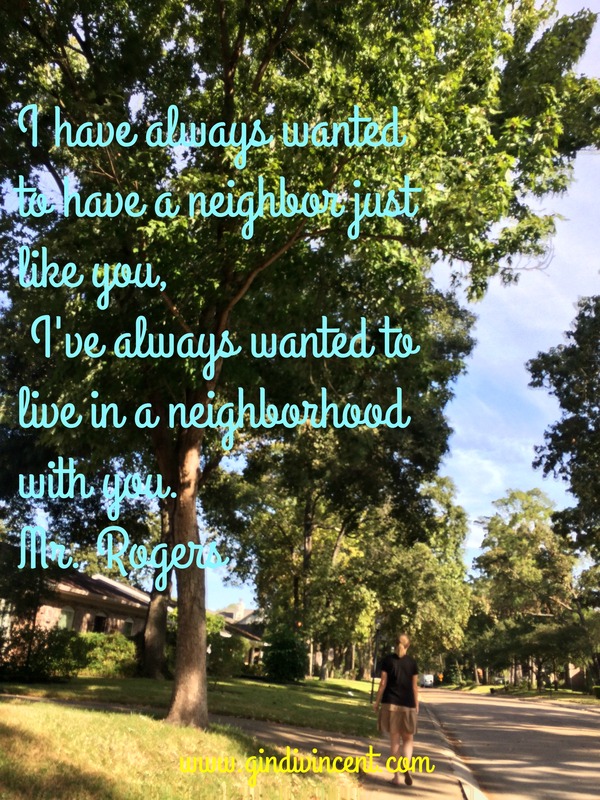 But this is what was more uncomfortable to me: I have lived on my busy street in west Houston for eight years and I don’t know anyone that lives around me. All of the 15 flyers I passed out on either side and across from my house went to people whose names I didn’t know and whose stories I’d never heard. That became unacceptable. And God basically let me know that He was proposing this as the solution. I felt like I was going to throw up as soon as we delivered those flyers. So there we stood, in the front yard, with ten boxes of pizza, a big cooler of water bottles and juice boxes, and a bowl of name tags (because I’m terrible with names and I figured if we all put our house number we’d know where the others were located on the street). I could have cried. In one hour, six families on a busy street in a big city met and had dinner. I heard the most amazing second chance love story from the retired couple down the street. We discovered the husband in the house next to us is from Louisiana like Bray’s family and hunts and fishes just as avidly. We had five different private schools represented because most of the families in our neighborhood don’t attend the public school where we are zoned. Two moms offered to help me host December’s Monthly Monday of cookies and cocoa. And everyone was told this table was theirs too. That our house could be a place they were always welcome to come visit. 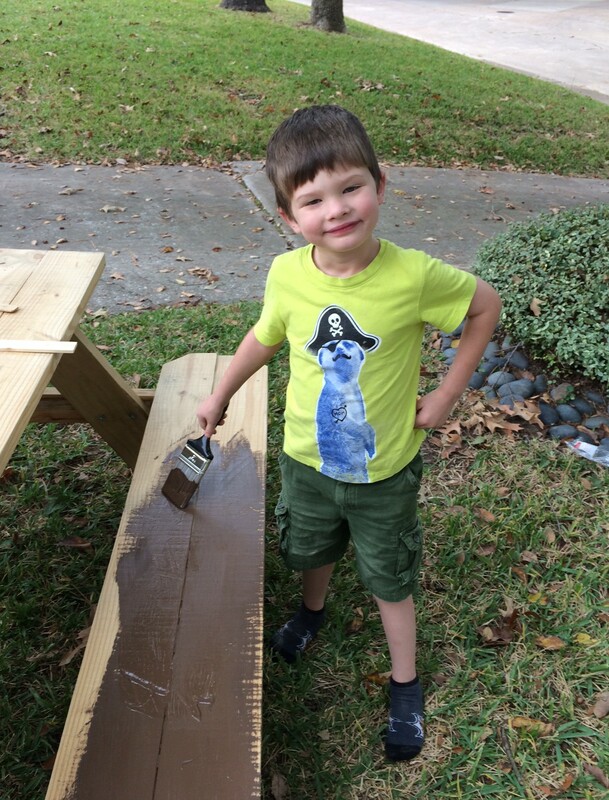 My kids maybe started to learn that our space has been given to us to share with others. I’ve been trying to survive with work and triplets and a maze of schedules and competing demands. I need to show the kids, and myself, that life shouldn’t all be rushed and hurried and that we can’t hide out behind our four walls when we get a spare moment to regroup. Instead, we have to clear out some of the clutter and make time for community. That’s what we’re missing. That’s what we all need more of. Community.